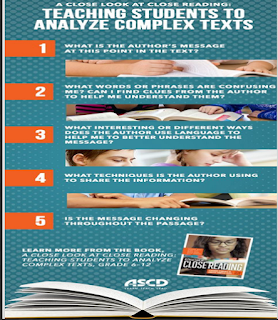 Close reading is a key literacy practice highlighted in the Common Core State Standards. It is a skill that empowers students to critically analyze complex text and understand its nuanced meanings. 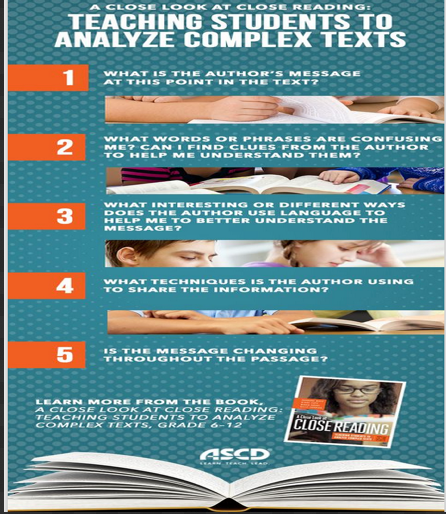 Close reading goes beyond the surface reading to delve into the layers of meanings nested in the deep textual layers. In their wonderful book, A Close Look at Close Reading: Teaching Students to Analyze Complex Texts, Grades 6–12, ‘literacy experts Barbara Moss, Diane Lapp, Maria Grant, and Kelly Johnson explains how to teach middle and high school students to be close readers, how to make close reading a habit of practice across the content areas, and why doing so will build content knowledge.’ Check out this post to learn more about this book. 1- What is the author’s message at this point in the text? 2- What words or phrases are confusing me? Can i find close from the author to help me understand them? 3-What interesting or different ways does the author use language to help me to better understand the message? 4- What techniques is the author using to share the information? 5- Is the message changing throughout the passage? Check out the full visual from this page.